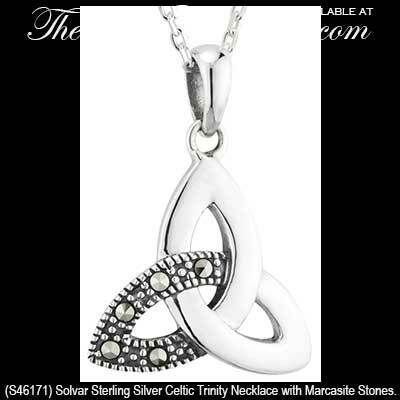 Celtic necklace features a marcasite stone enhanced Trinity knot along with sterling silver construction. This marcasite stone enhanced Celtic necklace is a traditional shape sterling silver Trinity knot that measures 5/8” wide x 3/4" tall, including the jump ring and the chain bail, and includes a 18" long sterling silver chain. This set of sterling silver Celtic jewelry features a Trinity necklace and stud earrings that are enhanced with marcasite stones. These sterling silver Celtic earrings are drop Trinity knots that are accented with marcasite stones.